Surprise, puppies don’t come potty trained. We were painfully reminded of this fact the first night our little Pickle came home. She was stressed out with an upset stomach and her poo was, well, loose. To add extra trauma to our already unpleasant evening, Pickle is too young to be out on public ground where lots of dogs are able to go to the bathroom. Her immune system is not yet strong enough to fight off lots of the illnesses older dogs carry, and is still 5 weeks from being completely vaccinated. Oh, and there’s the little, minor, not-that-big-of-a-deal issue of us moving into a new place that does not have a grass yard. In a small 1-1/2 X 2-1/2 ft tub, we gave her the only yard that we could. We filled it with dirt, and a small patch of sod that we hoped she would take and adopt as her short-term potty spot. Our efforts, though, were futile. She had come from a foster home with a full backyard to roam, and this little patch of sod wasn’t cutting it for her. For two days we suffered through accidents and using the sidewalk as her only potty spot. 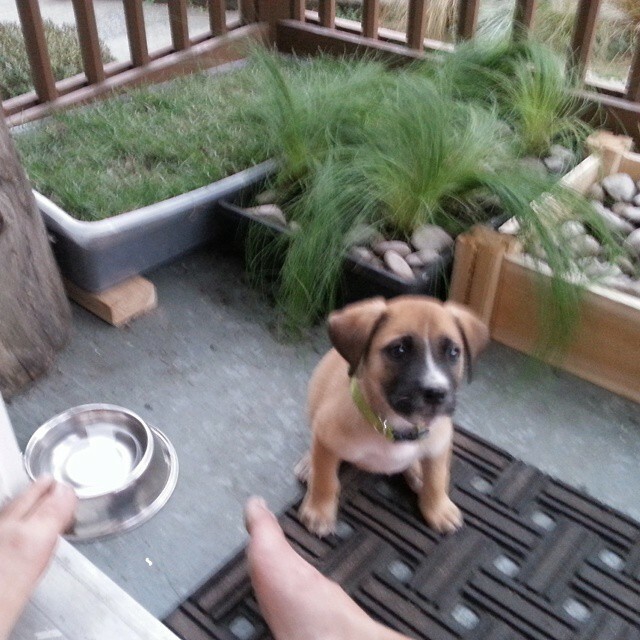 Any sign of squatting, and out we rushed to the porch, first to the sod, which she would usually tear up and try to destroy, then to the sidewalk where at least she had learned to do her business. It wasn’t ideal, but at least she was going to the bathroom. So we plotted. We schemed. We drew blueprints. And finally the three of us got in the car and drove to Home Depot. One cart load of planter boxes, grass plants, a bag of dirt and two bags of river rock later, we were in business. The result was turning our roughly 25sq/ft porch into a doggie play pen. 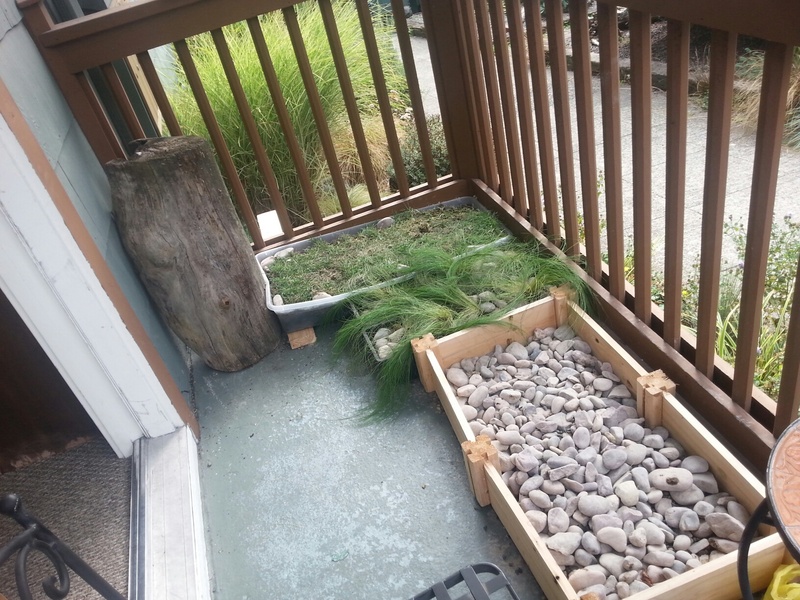 (Note, we started with the grass tub in the upper right.) She was instantly drawn to the different textures and terrain. I was glad the summer I just spent working alongside a landscape designer paid off! Soon, she was even using it to go to the bathroom! Some natural questions follow (at least in my head) about keeping the space clean. Well, we’re working on that. I made the joke this morning (much to the annoyance of my girlfriend) that date night now involved a bucket of soapy water, two scrub brushes, and soiled river rock. I think she’ll buy in soon. At least Pickle has bought in and seems happy with the space. Soon as she’s old enough we’ll be able to branch out (and maybe even get our sitting area back) and we can dismantle the play pen. But for now, I’m just happy she’s not going inside. Previous PostGeorgia Peaches Puppy RescueNext PostOk, she’s Fixed, Can we Have Our Puppy Now?